If you are looking for an excuse to install and test Adobe AIR, here is one -- Klok, a sleek and easy to use time tracking tool designed for freelancers and small businesses. Despite being a lightweight application, Klok is packed with useful features that can help you to track the time you spend on your projects with utmost efficiency. Obviously, to make Klok work on your system, you have to install Adobe AIR first. Fortunately, this can be done in a few simple steps. Go to the Adobe AIR download page, grab the Linux version of the installer and save it in your home directory. Run the installer in the terminal using the ./AdobeAIRInstaller.bin command. Download the latest version of Klok and use the Adobe AIR Application Installer (under the Applications -> Accessories menu on Ubuntu) to install it. Using Klok is as easy as it gets. First add the projects you want to track using the Add Project button. In the Project View section, you can change each project's properties such as contact info, hours estimate, and color code. Here you can also add sub-projects and archive specific projects. Klok offers two ways to track a specific project. Select the project from the Currently working on drop-down list, and Klok starts the timer. Press Stop when you are finished, and Klok automatically adds a time entry. 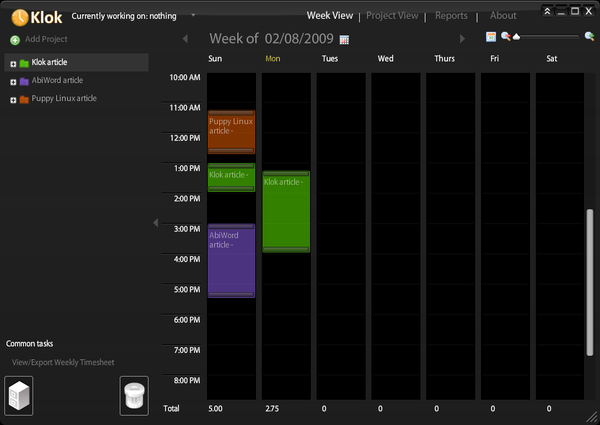 Alternatively, you can drag the desired project onto a specific day in the Week View section and use the handles to adjust the time entry. Double-click on any time entry in the Week View, and you can add notes in the Comments field (e.g., a short description of the work done). The Reports section allows you to generate sleek graphs that can help you to analyze your time tracking data visually. With a single click, you can generate a graph for the current or previous week and month. Of course, you can manually specify the desired period, too. Neither Klok nor Adobe AIR are open source, so if you prefer to keep your machine free of proprietary software, they are not for you. But the clever interface, just the right amount of features, and sheer ease of use make pretty compelling arguments for giving Klok and the whole Adobe AIR idea a try. It has been a long road but I am happy to say that Klok 2 is now available. There is a free version that you can download now which you can upgrade to the full version by purchasing a license key on the Klok website. Visit the Klok website at getklok.com for more information.